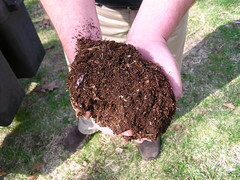 Compost Days in Seattle begins on Friday, April 1 with local activities including garden-building and free compost. The day starts at 10 a.m. with a garden-building project for the Hohlfeld family at S. Bayview and 16th Avenue S., in conjunction with Spring into Bed, a non-profit organization that constructs gardens for low-income families so they can grow organic food in their own backyard. Compost Days is a partnership between Cedar Grove Composting, Seattle Public Utilities, and local retailers. I was hoping to get an opinion from your readers on the topic of mandatory food composting for multifamily residents (apartment and condo residents). The city of Seattle is considering the idea of making food composting subscriptions mandatory for this sector of our city. It is already mandatory for Seattle residents living in single family homes. This requirement would mandate landlords and building managers provide food composting service to the occupants of the building for a cost that is similar to the cost that single family residents incur for this service. Several tenants may share a food waste cart so the cost could potentially be divided up to a much smaller number for each tenant. SPU estimates that there are 15,000 tons of organics going into the garbage from multifamily tenants currently. The city already provides voluntary food waste subscribtions to multifamily residents although only about 1,200 tons of organics is currently being diverted through voluntary means. The city is considering the implementation for the fall of 2011. I’d like to get input from BHB readers on how this would impact them positively, negatively or otherwise. Please send an email to Laura at feinstei@mail.com or leave a comment here on the blog with your input.